so that's 8 for notary public; 7 for religious figure; 2 for ordained friend; 8 for JP/judge; and 2 for other, one of which was elvis (as in, las vegas elvis!). are you surprised? what about you? if you're getting married, who is going to marry you? 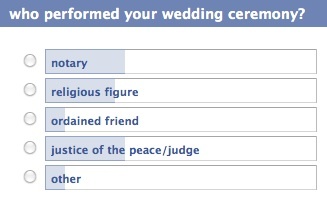 if you're already married, who performed your ceremony?